Hurricane Florence Wreaks Havoc | Kid Reporters' Notebook | Scholastic Inc.
A flooded intersection in North Carolina’s Pender County. 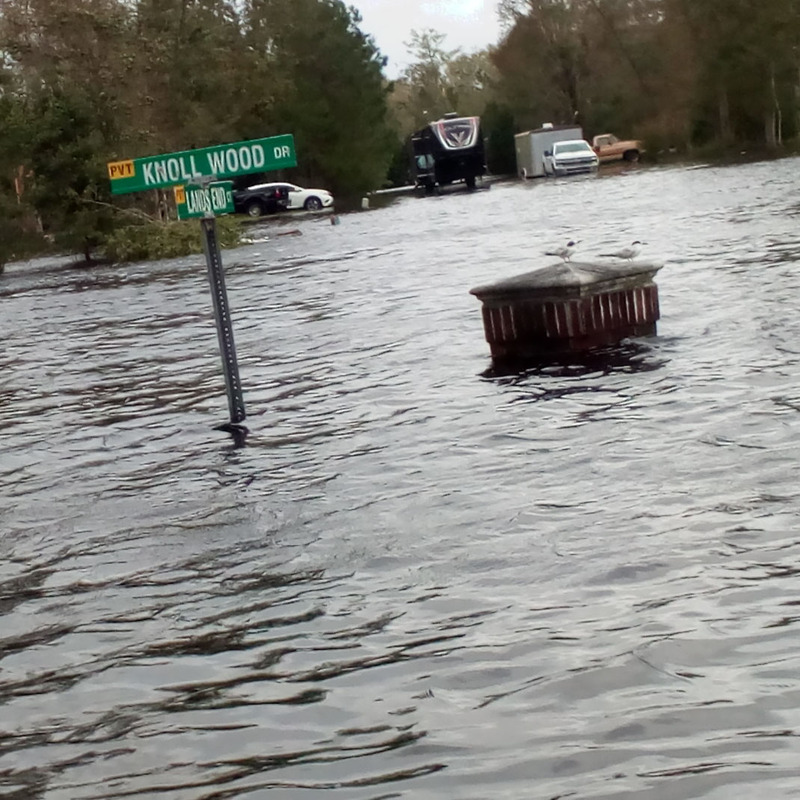 Hurricane Florence left many communities underwater. “Flood waters are still raging across our state,” North Carolina Governor Roy Cooper said at a news conference on September 16. The slow-moving storm had “dumped more than two feet or more” of rain in many areas, the governor added. Before Hurricane Florence made landfall on the coast of North Carolina on September 13, it was expected to be a Category 4 storm. However, it had weakened to a Category 2 while still churning over the Atlantic Ocean, eventually becoming a tropical storm. After hitting the coast, the storm moved inland over the next few days, causing historic amounts of rainfall in many areas. Hurricane Florence was blamed for at least 42 deaths, 31 in North Carolina, 9 in South Carolina, and 2 in Virginia. According to authorities, 1 million people lost power during the storm, which caused damages estimated at $170 billion. Most of the damage came from flooding and high winds. As the hurricane approached, weather reports painted a dire picture. Many residents of coastal cities were told to evacuate. People who decided to stay flocked to supermarkets, leaving the shelves empty of water and canned food. Flashlights, batteries, and gas-powered stoves were also sold out. The coastal city of Wilmington was hit especially hard. “My house is there and underwater,” said local resident Qiangsheng Xiang. The town of Swansboro set a record with more than 30 inches of rain. In Hillsborough, an oak tree toppled a power line. The tree was about 225 years old and knocked out power in the area. The refrigerator and furniture were overturned in Balan’s house and the carpets were drenched, forcing him and his son to flee to a friend’s house. Teresa talks with Jose Balan about the damage the storm caused to his home. After the storm, Xiang said, “Most people think that Florence is gone and that life is back to normal. Well, the nightmare has just started for some people.” He has been away from home for a week and still cannot return because of rising waters. Floods, downed trees, power outages, closed roads, and a potential outbreak of contagious diseases are posing continuing threats. Flood damage in North Carolina closed roads and exposed utility lines. State agriculture officials reported that 5,500 pigs and 3.4 million chickens and turkeys were killed in the storm, with the numbers expected to rise. Contaminants from hog waste, mixed with other pollutants in the flood waters, could harm people with health problems, officials warned. Michael Jordan, a former NBA star and chairman of the Charlotte Hornets, is providing financial assistance to victims of the storm. He grew up in Wilmington.